My first ornament is made with the Stampin’ Up! Simply Pressed Clay. This clay is so easy to work with; I just rolled it out to about 1/8″ thickness, then cut it using a scallop circle cookie cutter. Leaving the clay inside the cookie cutter, I placed the whole thing in the freezer to let the clay firm up (I went & did other things, so I ended up leaving the clay in the freezer for a couple of hours; just a 1/2 hour would be enough). Once the clay was firm, it popped right out of the cookie cutter with no stretching or warping. I had tried taking it out of the cookie cutter right away – disaster! The clay ended up sticking to the cutter, and I stretched it – so I ended up rolling it up again, and starting over 🙂 Trust me – the freezer is the way to go! After removing the clay from the cookie cutter, I used my Coastal Cabana Blendabilities Markers to create the sky background. I then stamped the tree and the deer images in Memento Black Ink from the White Christmas stamp set. Since I don’t have the Crumb Cake Blendabilities Markers, I just used my Baked Brown Sugar Stampin’ Write Marker to colour in the deer, and then added some glimmer to the snow & tree by using my 2 Way Glue Pen to trace the snow line, and then applied Dazzling Diamonds glitter. The snowflakes were added using the Chalk Marker; the Blackberry Bliss smudging in the skyline was an accident – I didn’t know that I had some ink on my finger, and smudged it on my ornament! 🙁 So, I decided to make it an evening scene….are you buying it?! Then I threaded some Gold Baker’s Twine through the hole in the top, and tied a double bow. 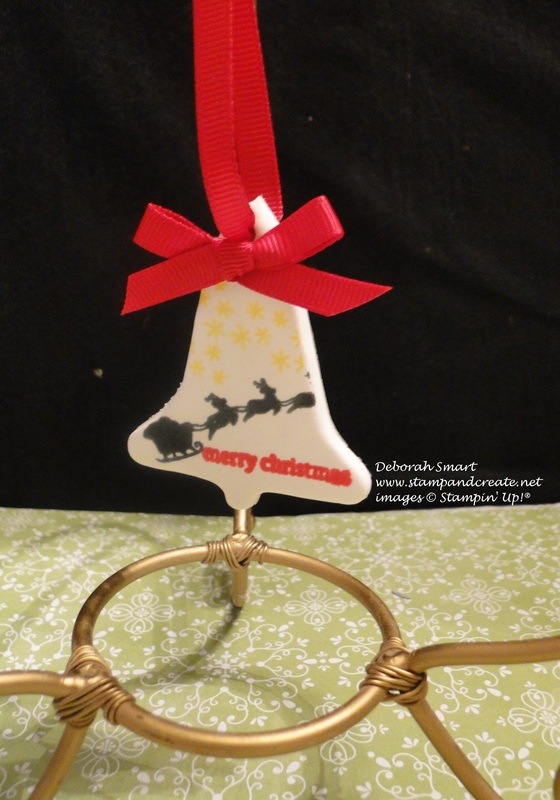 I made one more Simply Pressed Clay ornament – this time using a bell-shaped cookie cutter. This time I used the Holiday Home stamp set, and stamped the Santa Claus & reindeer silhouette in Memento Black ink, and the stars in Daffodil Delight ink. The Merry Christmas is also from this stamp set – so versatile! – and stamped in Real Red ink. A Real Red ribbon hanger and bow finish it off. 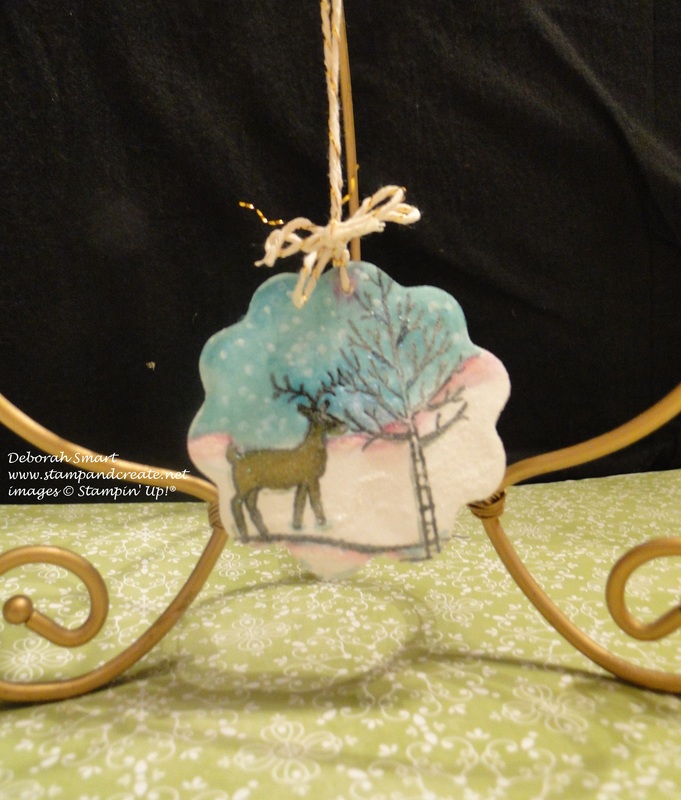 This next ornament was inspired by our own Ilina Crouse, who is also a Creation Station team member. It’s always fun when you get inspiration from another demonstrator, and make it your own. I combined 2 of my favourite sets from the Holiday catalogue – White Christmas and Holiday Home – for this ornament. I bought the clear bauble halves from one of those ‘big box’ stores (you can buy either whole ones, or ones that are in 1/2, and can be snapped together if you wish). First I cut out a circle in Whisper White card stock to fit the bauble, then glued on a piece of All is Calm Designer Series Paper for the sky portion. Then I tore strips of Whisper White card stock for the layers of snow, and glued them onto the bottom half of the large circle. I stamped the snowman, polar bear and trees on a separate piece of Whisper White in Memento Black ink, and used my Blendabilities Markers to colour in the trees and the snowman’s scarf, hat and nose. I added a few highlights of Sky Blue to the polar bear. After cutting them out with my Paper Snips, I attached them to the scene base using Stampin’ Dimensionals, and then stamped the Santa & reindeer silhouette in Memento Black ink across the ‘sky’. Once again I added some glimmer to the snow drifts by tracing them with the 2 Way Glue Pen, then covering the glue with Dazzling Diamonds glitter. I then used my Crystal Effects and applied a thin line around the edge of the bauble, then attached the bauble to the scene. 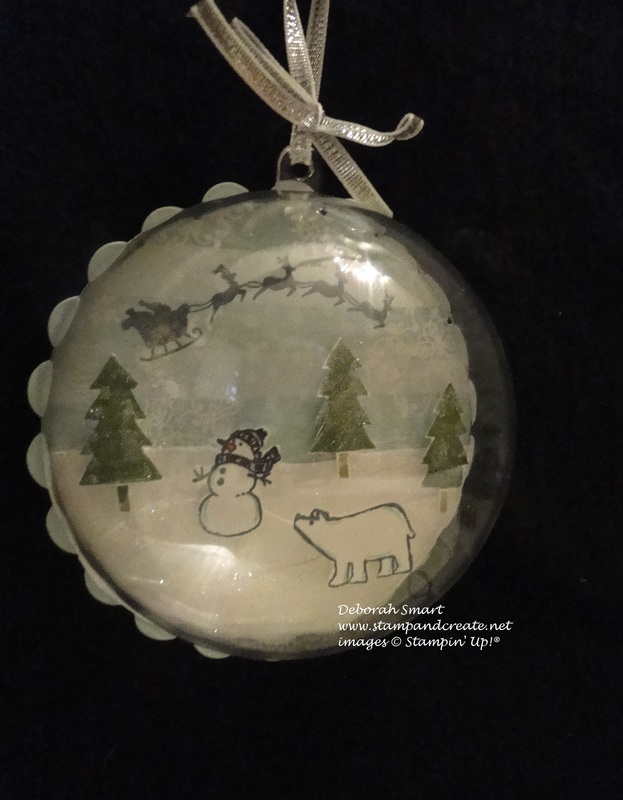 I then attached a scallop circle in Soft Sky card stock to the underside of the whole bauble, and the 1/8″ Silver Ribbon tied in a bow for the hanger. I just love how it turned out, and I can’t wait to make lots more of these, with lots of different scenes! For my last ornament, I decided to go (almost) strictly paper, and made this honeycomb ornament. 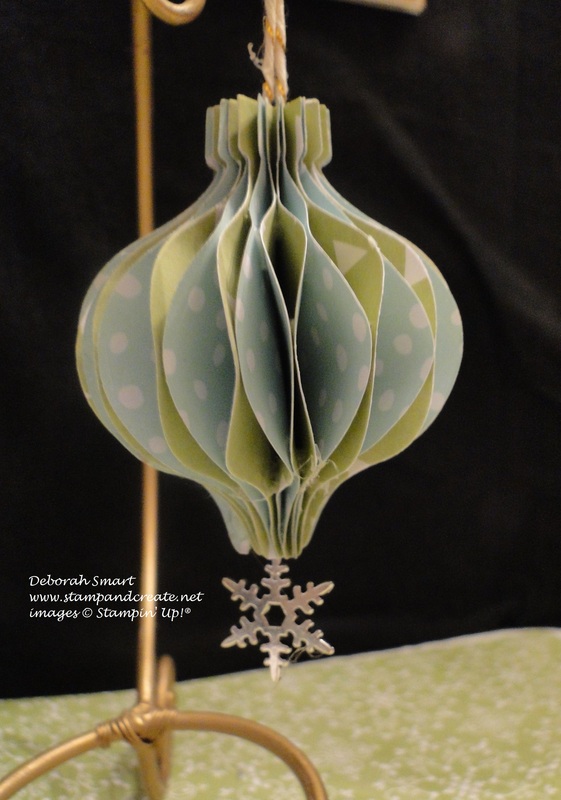 I knew I wanted to do a paper ornament, but wasn’t sure what kind – until I found the tutorial for this honeycomb ornament over on Splitcoaststampers. That site is a fabulous resource for so many things! 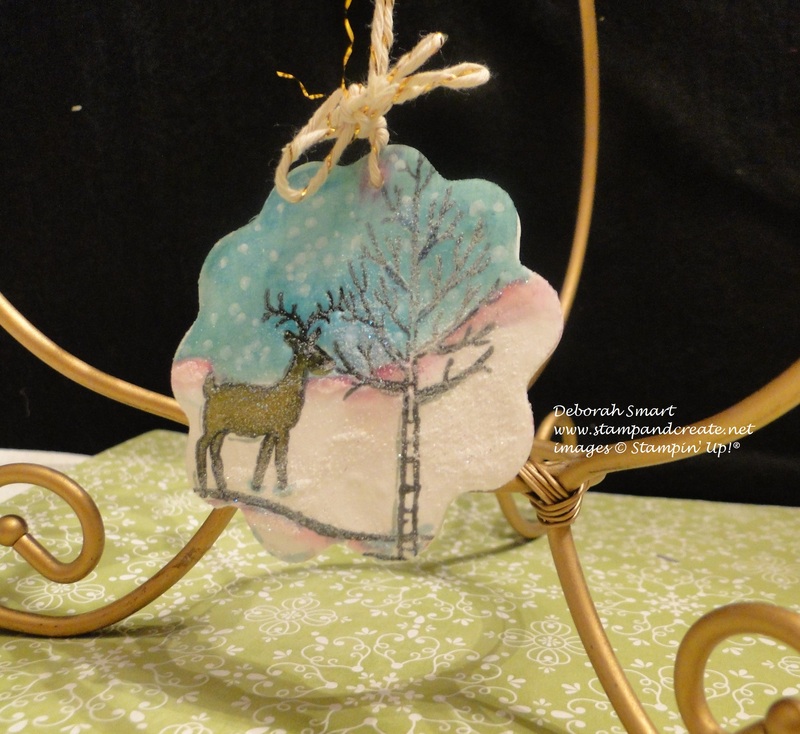 I made my ornament from the All is Calm DSP (yes, I love that paper! ), and used the Ornament Framelits from last year’s holiday catalogue (c’mon – I’m not the only one holding one to those, am I?!). The tutorial calls for using ‘agressive glue dots’ – I found out quickly what that means! I actually had to go back after completing the ornament and add some hot glue in some places; I think that even though the DSP isn’t as thick as card stock, it’s still ‘stiff’ when it comes to making this time of ornament. It did turn out nicely though, I think! Before closing it up, I attached the All is Calm snowflake ornament to the Gold Baker’s Twine that I used as the loop. That’s my projects for this time- I hope you enjoyed seeing them, and I’ve helped inspire you to make some of your own, and create not just ornaments, but memories for 2014. I’d love to read your comment, if you would please take the time to leave a note. 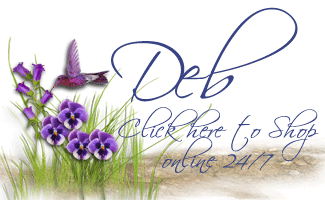 If you’d like to order any of the products I’ve used to create my projects, just click on the image below to be taken directly to my online store; or give me a call & I’ll place the order for you. Next Next post: ONLINE EXTRAVAGANZA SALE & 25% OFF NEW DEMONSTRATOR KIT!